November is here and the year is flying by. This month's program Lander 2 is an earlier one from 1983. 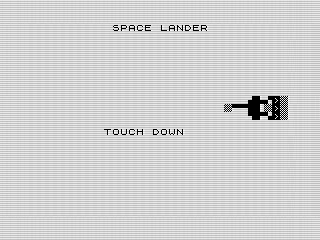 Oddly, the game displays Space Lander. Not very original as I've used that name before. I'm using the name I noted in my listing. Although it has graphical elements, it is really just a counting game. There are no arcade movements like many of my later games. A platform is randomly placed and you enter in how far to move the ship. There is no physics, fuel or other strategic elements at play. Simple, right? Agree, yet my high score is only 601. Can you best my score? From a technical standpoint, it is pretty straight forward game. Based on the line numbers, I added parts and pieces as I built the program. Just so you know, that really bugs me. I'm a bit of a syntax freak, often prettying up my code. 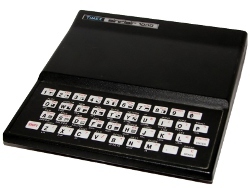 Renumbering on the ZX81 is a pain, though, so I'm not surprised that I didn't bother. Looking at the code, the graphics are straight forward sprites. I used simple print with spaces to emulate movement. Oddly, I let the space ship fly through the landing pad before crashing it. It would be an easy fix to test during the loop or calculate how far to fly. But in the end it doesn't really detract. The fewer moves you make, the better your score. There is an amount of randomness in how many points you get. Oddly, I only display your score when you crash and the game is over. Interestingly, if you move one space at a time, you might actually lose points. Sneaky, huh? Well, that is all for now. Enjoy the game!